A startling number of Americans may be putting their health at risk by not practicing good hand hygiene. When asked about their specific handwashing habits, a vast majority of adults (71 percent) say they regularly wash their hands, but that number may be grossly exaggerated. Nearly six in ten (58 percent) admit that they have witnessed others leaving a public restroom without washing their hands. More than a third of Americans (35 percent) have witnessed co-workers leaving facilities without washing, and one in five consumers surveyed (20 percent) have witnessed restaurant employees not washing their hands at all. The worst offenders seem to be men by a significant margin. These survey findings were released by SCA to commemorate Global Handwashing Day. The company conducted the survey to gauge consumer awareness of proper hand hygiene but found that while many Americans recognize that handwashing is an important step to staying healthy, awareness does not necessarily translate into practice. Sixty percent of adults describe handwashing as being critical to their health, and over half (53 percent) consider washing their hands thoroughly and regularly to be the most beneficial practice for staying healthy. Yet, respondents also admit to skimping on personal hand hygiene after coming into contact with a number of germy environments and objects. Nearly four in ten adults (39 percent) admit to not washing their hands after sneezing, coughing or after blowing their nose. More than half of Americans do not typically wash their hands after riding public transportation (56 percent), using shared exercise equipment (51 percent) or handling money (53 percent). "The average human hand has millions of bacteria, many good, but also sometimes some that can harm health. In addition, we can also carry viruses from touching surfaces that are contaminated," said Dr. Allison Aiello, associate professor of epidemiology at the University of Michigan and a member of SCA’s Tork Green Hygiene Council. "While over half of survey respondents believe that handwashing is important, there are still clear gaps in the relationship between beliefs and practices." It seems American men could learn a thing or two about hand hygiene from their female counterparts. The survey found a dramatic disparity between the sexes when it comes to personal handwashing habits. More than a third of men (33 percent) admit they do not wash their hands thoroughly with soap and water after using the public restroom compared to just one in five women (20 percent). Men are also more likely than women to witness others leaving public restrooms without washing their hands (67 percent of men compared to 48 percent of women). In fact, men lag behind women in terms of whether they say they wash their hands in almost every scenario. Men are less likely than women to typically wash their hands after handling garbage, touching an animal, or sneezing or coughing. In addition, two-thirds of women (65 percent) describe handwashing as being critical compared to just over half of men (54 percent). Men, on the other hand, were more likely to describe handwashing as being a necessary hassle (36 percent of men compared to 26 percent of women). "More work is needed to better understand how educating individuals about hand hygiene can translate into improving practice," said Dr. Aiello. "We know that handwashing is an effective way to fight the spread of disease by removing harmful bacteria and viruses. Bypassing the sink and soap in the restroom or forgetting to wash after coming into contact with surfaces that are typically contaminated with bacteria or viruses will eventually lead to an infection and possibly days missed at work or school." • Get an adequate amount of soap to build a lather that will last for at least twenty seconds. • After lathering your hands, fingers and wrists for twenty seconds, rinse hands until all the soap is removed. • Dry hands thoroughly with a paper towel, as the friction from wiping with a paper towel removes any residual bacteria from your hands, and damp hands spread up to 500 times more germs than dry hands. 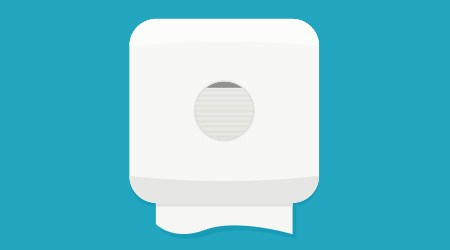 • Use the paper towel to turn off the faucet and to open the door as you leave the bathroom. Consistently consider all the right times to wash: Be more conscious of times when you should be washing your hands, especially when encountering shared surfaces, including after taking public transportation, before and after a meal, before and after preparing food, after handling money, garbage, or touching an animal, and after blowing your nose, coughing or sneezing. On average, you come in contact with 300 surfaces every 30 minutes, exposing you to 840,000 germs, so wash more often than just around bathroom breaks. Encourage healthy habits around you: Little things can go a long way to encourage good hand hygiene habits. The survey found that respondents are encouraged to wash their hands in a public restroom by clean and tidy facilities (61 percent), as well as other small restroom upgrades, such as hands-free faucets (61 percent), hands-free soap dispensers (58 percent), and paper towels as an option for drying hands (58 percent).